The CIBIL TransUnion Score is a 3 digit numeric summary of your credit history which indicates your financial & credit health. The Score is derived from your credit history as detailed in the Credit Information Report [CIR] and ranges from 300 to 900 points. Your credit score tells the lender how likely you are to pay back loan or credit card dues based on your past repayment behavior. The higher your score, the more the chance of your loan application getting approved! Did you know, 90% of new loans sanctioned are to individuals with a credit score of 700 and higher! Your CIBIL CIR is provided to you along with your score, because it is the basis on which your credit score is generated. It's a record of your credit history. i.e past loans or credit cards availed from various loan providers. who are members of CIBIL for more information please go to the Frequently Asked Questions section. A CIBIL Company Credit Report (CCR) can achieve this In today’s day and age, your business needs to be responsive to rapidly evolving market needs. Be it daily working capital, or for any expansion plans, you always need an access to finance. A CIBIL Company Credit Report (CCR) is a record of your company’s credit history. This report is used by loan providers to make informed lending decisions - quickly and objectively. 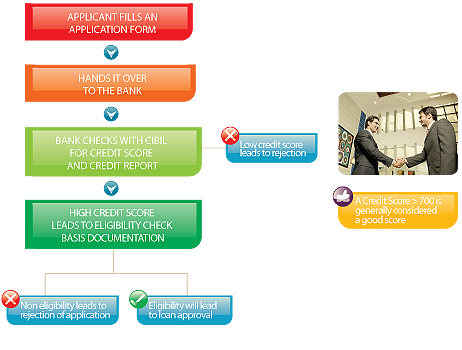 Just to make you understand about Loan approval process here is flow chart which will help you to understand better.